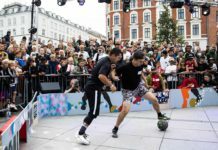 Eleven-year-old prodigy Shiou from Japan has been turning heads in the street football world with his impressive moves. Though he suffered an unexpected loss in the recent Pannahouse Invitationals, his advanced technique and high skill level was obvious to everyone in attendance. Shockingly, he’s only been working on his ground moves for about two years. Shiou practices solo every day and up to five hours at a time with his Pannahome team every week. According to fellow team member Yusuke Nagai, although panna games are gaining in popularity, the overall level in Japan is still not that high. Shiou is the youngest in their crew of 11, which is probably why he’s not afraid to take on older competitors no matter who they are. Considering he’s gone from relative newbie to crazy prodigy in two years, we’re scared for the rest of the competition in the very near future! Watch Shiou take on Evrim Nallar in the recent 2015 Panna Streetz Skills Battle!